I had mentioned how much I enjoyed this Unlikely Friends album when I posted my year end list of my favorite records of 2018. I hadn't written about this album prior to making the list as I hadn't yet purchased the CD. I kept holding out hope that eventually it would receive a vinyl release. Unfortunately that never came to pass, so I grabbed the CD version. All that did was make me wish there was a vinyl release even more. I love Unlikely Friends. As I was a pretty big fan of the band Boat, I eagerly follow D. Crane (or Dee Krain - whatever his name actually is) when the first Unlikely Friends album Solid Gold Cowboys came out (also only on CD...). 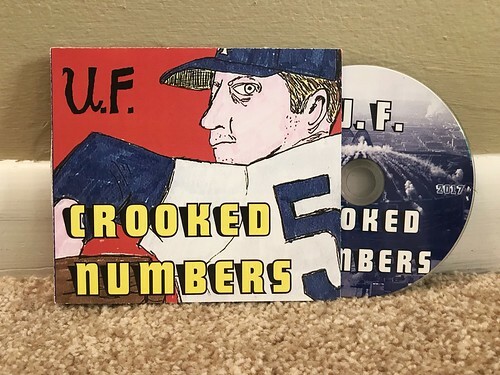 As great as Solid Gold Cowboys was, Crooked Numbers raises the game even higher. It's simply a tremendous album of indie rock with a powerful 90s feel to it. You could easily name check Pavement, Built To Spill, Superchunk, Guided By Voices and many others and while that would put you in a decent frame of reference, none of them truly describe what Unlikely Friends sounds like. The way the guitars intertwine with the vocal melodies and the incredible lyrical imagery is something very unique to Unlikely Friends. They are releasing some of my favorite music, I just wish someone would release this incredible music on vinyl. This is an album that deserves it and Unlikely Friends are band that deserves to be significantly more famous. Definitely check this one out. Heck, I'm even considering buying a 2nd copy as the cardboard sleeve of my CD split apart in shipping. Raise Mind - Farewell 7"
Not Wonk / The Full Teenz - Split 7"
V/A - All Temptation 7"